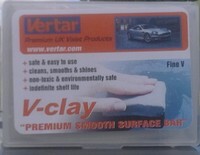 Vertar's own superb value, hi tech detailing claybar for safe, easy removal of bonded on surface debris on vehicle paintwork, glass, lights and bumpers. This finer, white clay is less aggressive than the blue, medium clay, for lightly or normally soiled paintwork. Now with 25ml of FREE Lubricant Concentrate for you to dilute up to 500ml in a spray bottle (not provided) for even better performance. No other 'water only' clay bar nor claybar and lube package is such outstanding value. And that was when the package was £8.95 - we've reduced pricing even more now on this detailing essential to an amazing £7.50 inc vat.